Our cattle, sheep,goats and hens eat a diet of pasture grass, hay in the winter and dry months and occasional apples from the nearby trees. 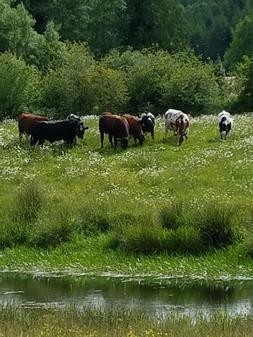 They have access to Pasture year round and roam the Globe Farms 50 Plus acres, and lounging along the pond or in the barn on hot days. In my Grandma's day, there was no such thing as a bad fat. All fat was "good" simply because it tasted good. My Grandma fried her eggs in bacon grease, added bacon grease to her cakes and pancakes, made her pie crusts from lard, and served butter with her homemade bread. My grandmother was able to thrive on all that saturated fat—but not my grandfather. He suffered from angina and died from heart failure at a relatively young age. My grandfather wasn't alone. Population studies from the first half of the 20th century showed that Americans in general had a much higher risk of cardiovascular disease than people from other countries, especially Japan, Italy and Greece. Was all that saturated fat to blame? The Japanese were eating very little fat of any kind, while the people of the Mediterranean were swimming in olive oil, an oil that is very low in saturated fat but high in monounsaturated oils. So, in the 1960s, word came from on high that we should cut back on the butter, cream, eggs and red meat. But, interestingly, the experts did not advise us to switch to an ultra-low fat diet like the Japanese, nor to use monounsaturated oils like the Greeks or Italians. Instead, we were advised to replace saturated fat with polyunsaturated oils—primarily corn oil and safflower. Never mind the fact that no people in the history of this planet had ever eaten large amounts of this type of oil. It was deemed "the right thing to do." Why? First of all, the United States had far more corn fields than olive groves, so it seemed reasonable to use the type of oil that we had in abundance. But just as important, according to the best medical data at the time, corn oil and safflower oil seemed to lower cholesterol levels better than monounsaturated oils. Today, we know that's not true. In the 1960s, researchers did not differentiate between "good" HDL cholesterol and "bad" LDL cholesterol. Instead, they lumped both types together and focused on lowering the sum of the two. Polyunsaturated oils seemed to do this better than monounsaturated oils. We now know they achieve this feat by lowering both our bad and our good cholesterol, in effect throwing out the baby with the bathwater. Monounsaturated oils leave our HDL intact. In hindsight, it's not surprising, then, that our death rate from cardiovascular disease remained high in the 1970s and 80s even though we were eating far less butter, eggs, bacon grease, and red meat: We had been told to replace saturated fat with the wrong kind of oil. But there was another reason we were losing the war against cancer: the supposedly "heart-healthy" corn oil and safflower oil that the doctors had advised us to pour on our salads and spread on our bread contained high amounts of a type of fat called "omega-6 fatty acids." There is now strong evidence that omega-6s can make cancer cells grow faster and more invasive. For example, if you were to inject a colony of rats with human cancer cells and then put some of the rats on a corn oil diet, some on a butterfat diet, and some on a beef fat diet, the ones given the omega-6 rich corn oil would be afflicted with larger and more aggressive tumors. In the early 1990s, we learned that our modern diet was harboring yet another unhealthy fat: trans-fatty acids. Trans-fatty acids are formed during the hydrogenation process that converts vegetable oil into margarine and shortening. Carefully designed studies were showing that these manmade fats are worse for our cardiovascular system than the animal fats they replaced. Like some saturated fats, they raise our bad cholesterol. But unlike the fats found in nature, they also lower our good cholesterol—delivering a double whammy to our coronary arteries. "Maybe butter is better after all," conceded the health experts. Then, at the tail end of the 20th century, two more "good" fats were added to the roster—omega-3 fatty acids and conjugated linoleic acid, or CLA, the fat found in the meat and dairy products of ruminants. Both of these fats show signs of being potent weapons against cancer. However, the omega-3s may be the best of all the good fats because they are also linked with a lower risk of virtually all the so-called "diseases of civilization," including cardiovascular disease, depression, ADHD, diabetes, Alzheimer's disease, obesity, asthma, and autoimmune diseases. Products from grassfed animals offer us more than omega-3s. They contain significant amounts of two "good" fats, monounsaturated oils and stearic acid, but no manmade trans-fatty acids. They are also the richest known natural source of CLA and contain extra amounts of vitamin E and beta-carotene. Finally, grassfed meat is lower than feedlot meat in total fat and calories, making it ideally suited for our sedentary lifestyles. I don't believe it's a matter of luck or chance that grassfed products have so many of the good fats but so few of the bad. In fact, I'll wager that the more that is discovered about fat in the coming years, the more grassfed meat will shine. The reason for my confidence is simple: our bodies are superbly adapted to this type of food. In the distant past, grassfed meat was the only meat around. Our hunter-gatherer ancestors either brought home a grazing ruminant such as elk, deer, or bison, or a predator that preyed on those animals. Either way, the nutrients found in grass made their way into the animals' flesh, and ultimately, into our own. Over the eons, our bodies began to "expect" the kinds and amounts of fat found in grassfed meat. Our hearts counted on the omega-3s to stabilize their rhythm and keep blood clots from forming. Our brain cells relied on omega-3 to build flexible, receptor-rich membranes. Our immune systems used the omega-3s and CLA to help fend off cancer. And because wild game is relatively lean, our bodies weren't burdened with unnecessary amounts of fat or calories.